The Bella Coola tree trunk that graced the centre of the B.C.-Canada Place pavilion at the 2006 Turin Winter Olympics is back in its rightful place. But only just. The thousands of tourists' hands that ran over the smooth yellow cedar trunk that forms the centrepole of the large log house have dispersed to the four corners of the world. But whether thousands more will ever touch the tree or get to enter the pavilion now depends upon whether politicians and a small group of volunteers succeed in finishing a grand scheme, both a monument to Canada and a gift to Italy. "Casa Canada," as it is now called, has run out of money just as it was to be finished, and there is faint hope there will be more. What started out as an ambitious project to leave an iconic piece of Canada in Italy after the Olympic and Paralympic Games has become an expensive political headache. Once the centrepiece of a $6-million effort by B.C. 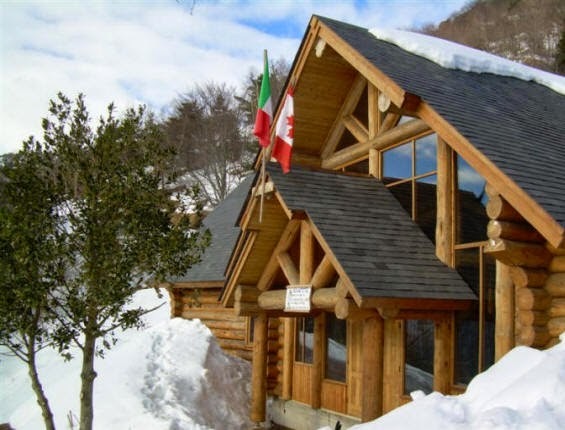 and Canada to leverage Canadian-Italian business and cultural relations, Casa Canada -- built from pine beetle-killed wood by Sitka Log Homes of 100 Mile House -- languished in Turin for nearly three years as politicians haggled over who should pay for moving it to this town at the foot of the Piedmont mountains. "It is a very sad story, really," said Giorgia Zerboni, a press officer with the city of Turin. "There was much argument over this." So far, more than $800,000 has been spent by the regional, provincial and city governments around Turin in trying to relocate the log structure to its new mountain perch under Rocca Sbarua, a popular hiking and rock-climbing area. Turin itself gave the chalet to the Alpine Club of Italy, along with $80,000. Volunteers with the Pinerolo division of the club, which now owns the pavilion, need at least another $320,000, according to Silvio Farinetti, one of those involved in the project. "The local mountain governments have turned us down, and we are still waiting for word from the Piedmont regional government," he said on Monday. Where the money went is unclear. Farinetti said much of the work was done as in-kind services provided by contractors, moving companies and a bank. The chalet was only moved to the area in the summer of 2008, and workers hastily finished the exterior before a record snowfall dumped three metres on the mountains. On Monday, Farinetti and a translator, Cristina Bianclotto, offered a tour of the unfinished chalet. It has been reassembled under the imposing face of Rocca Sbarua, a jagged set of granite teeth that tower over Pinerolo. Officially, it is known as "Casa Canada Rifugio Giuseppe Melano", a "refuge" that replaced the first hut of the same name. But it is hardly a remote, rural area. From where Farinetti and Bianclotto stood they pointed out several climbing parties on the faces of Rocca Sbarua. Turning around, one could see the houses of neighbours just down the valley. With a few minor changes, the building is the same as it was when it sat in Piazza Valdo Fusi, a grey and worn parking plaza tucked away in Turin from the other Olympic-related celebration sites. 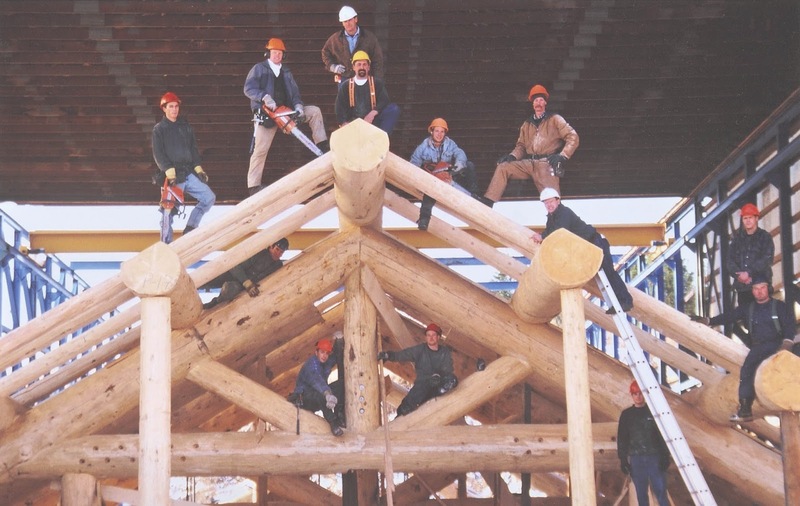 The log pavilion is largely unfinished inside, and there is still much to do. Gone is the rock fireplace where politicians and commoners alike gathered when B.C. held hospitality nights. The kitchen, dining room, two 12-bed dormitories and equipment room for the local search and rescue group have yet to be finished. Also gone is the set of ornately-carved doors carved by Squamish First Nations artist Aaron Nelson-Moody. B.C. insisted on repatriating the doors -- works of art, really -- back to Canada after the Games to be displayed at its provincial pavilion during the 2010 Games in Vancouver. In their place were set a pair of pine doors to which no one can seem to find the right keys. So visitors have to climb in through a back door. But its new home is a vast improvement over its last one. During the Olympics, Piazza Valdo Fusi was the place for thousands of Italians to experience Canada's hospitality, but it has since reverted to a grubby plaza filled with grafitti. Many of its granite pads are broken, surrounded by barriers, and no one goes there to linger. "I do not like coming to this place," said Marina Delpiano as she walked quickly through the plaza. "It was so much more beautiful when Casa Canada was here." At the end of the Games, the building was supposed to be moved to its site in the little town of San Pietro Val Lemino. But almost instantly the local and regional politicians began fighting over who should pay for moving it. For the next two years, it sat right where it was in the decrepit square, the target of vandals and grafitti artists. Cesare Vaciago, Turin's city manager, nodded his head when asked about the troubles. "Yes, there has been some problems, mostly about money," he said. Farinetti admits the alpine club could probably have built a new hostel for much less -- especially since it had to build a rough and steep gravel road to get the massive logs in the last half-kilometre to the site. But Canada's gift is a magnificent one, he said, and Italians everywhere are proud of it. After word spread that the building had been relocated, the club was inundated with requests for reservations, he said. It is the only one of its kind in Italy. Bruno Giay, one of the first volunteers to work on the project, said they don't regret receiving the chalet, despite the deep political problems the gift created. "No, no, no," said Giay. "We love Casa Canada. It is because of politics that this has happened." Farinetti said most of the major work to be done involves running water and electrical lines from a point just above San Pietro. "We know people want to come and stay there. It is a beautiful building. We are hoping to maybe open it next year but that won't happen if we can't find the money."